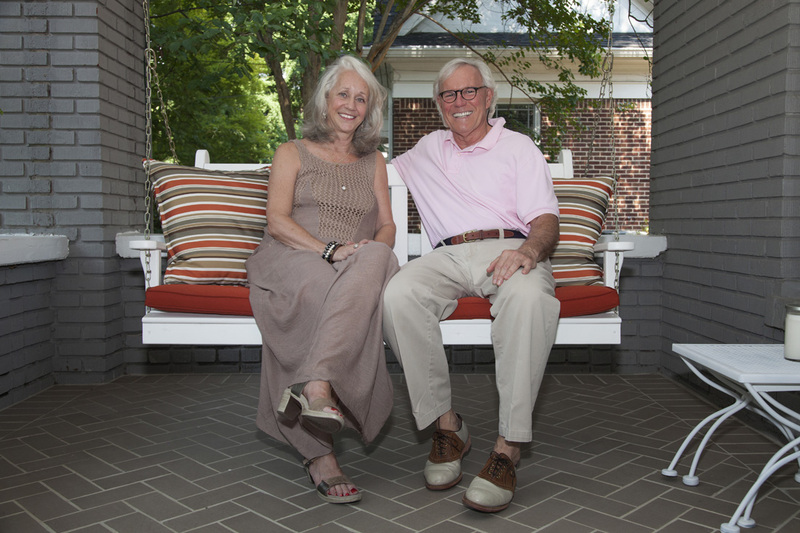 An empty nest and grueling commutes inspire Jan Winburn and Bill Mason to swap suburban living in Roswell for a charming intown oasis. Winburn and Mason on the porch of their home. For many empty nesters, seeing the last of the kids off to college or out into the real world means finally being free to pursue a suburban lifestyle, far removed from school drop-offs, sports practices, class performances and PTA meetings. 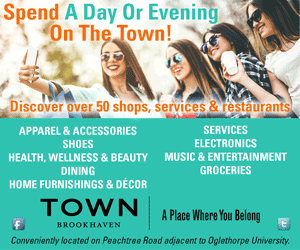 But in 2014, with her grown daughter gone from the Roswell home they’d shared, plus a grueling commute downtown to her office at CNN, Jan Winburn and her partner, Bill Mason, didn’t have their sights set on more years of suburban dwelling, but rather on a move smack into the heart of Atlanta. “When I first started working at CNN, my commute was around 40 minutes and could be an hour in bad traffic,” says Winburn. “It had grown to about 90 minutes.” About to become empty nesters and living in a house that Winburn says was too big for two people, she and Mason, who himself spent nearly six years commuting between Atlanta and Baltimore, decided it was time to make the move into town. 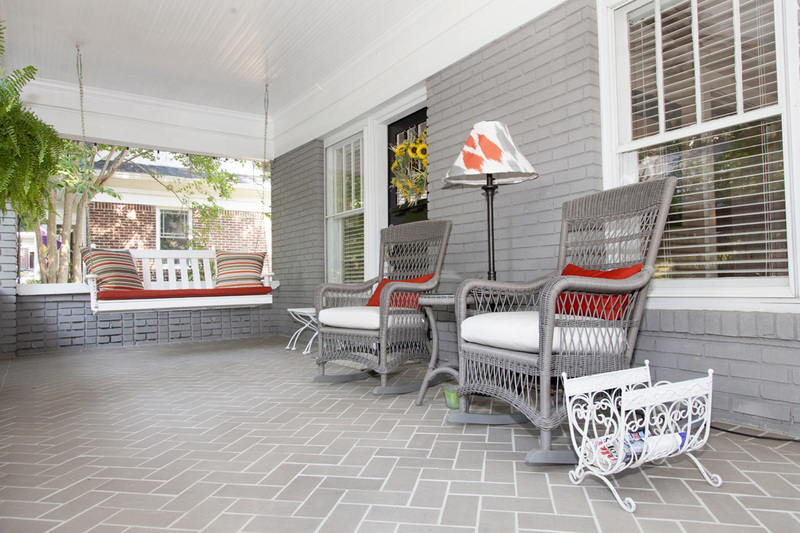 Updating the porch’s tile floor with brick pavers in a more modern herringbone pattern was among the couple’s earlier home-improvement projects. When it came to their new home’s must-haves, the couple wanted to be in a walkable place and to have a front porch where, Winburn says, “you could sit and watch the world go by.” As goes the process for many prospective home buyers, Winburn and Mason recall being distracted during their search by homes with features that, while not essential, they found appealing. “We started looking, and we’d see all these other things that we really liked,” she says. “We actually put a bid on a couple houses that, in retrospect, I’m so glad we didn’t get because they didn’t have a front porch, and they weren’t as walkable.” With help from their Sotheby’s real estate agent, Allie Burks, Winburn and Mason regrouped and reestablished their priorities. The exercise worked, and the couple found the perfect place, a charming 1923 Craftsman in Morningside-Lenox Park with a wide, shaded porch and within easy walking distance of Piedmont Park. Winburn and Mason gutted their kitchen, which is now a bright space with marbled granite countertops, a spacious island and easy access to the adjacent dining room. Once the house was officially theirs, the couple set about putting their personal style stamp on it, a process they began by replacing what Winburn describes as the porch’s “gaudy tile floor” with a more modern herringbone pattern in brick, and installing hardwood floors on the upper level. Despite the fact that the couple’s predecessors made many structural improvements to the home, Winburn and Mason decided to gut the kitchen, replacing old cabinetry, clearing out bulky pantry space and installing a large island. They also replaced an original swing door with a pocket door that allows for easy, unobstructed passage into the adjacent dining room. During the kitchen renovation, frosted block glass was revealed in the wall of a staircase that leads to the basement, a feature Winburn says some homeowners might find off putting, but one that she and Mason came to enjoy. “It was original to the home and had just been built over throughout time, so when we discovered it, we said, ‘Hey, this is great; let’s bring it out and let in some light,’” Mason says. 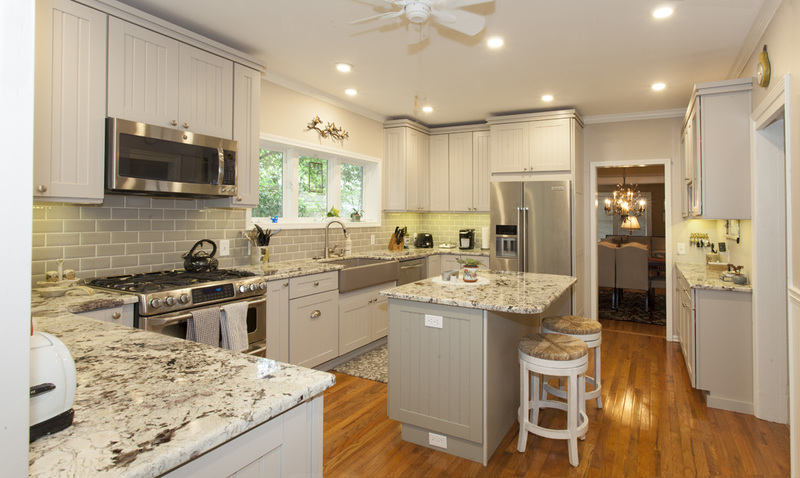 The island’s contemporary granite countertop gleams in that light, giving the kitchen a fresh, new feel, while the kitchen’s high ceilings and beadboard keep the space anchored in its original era. 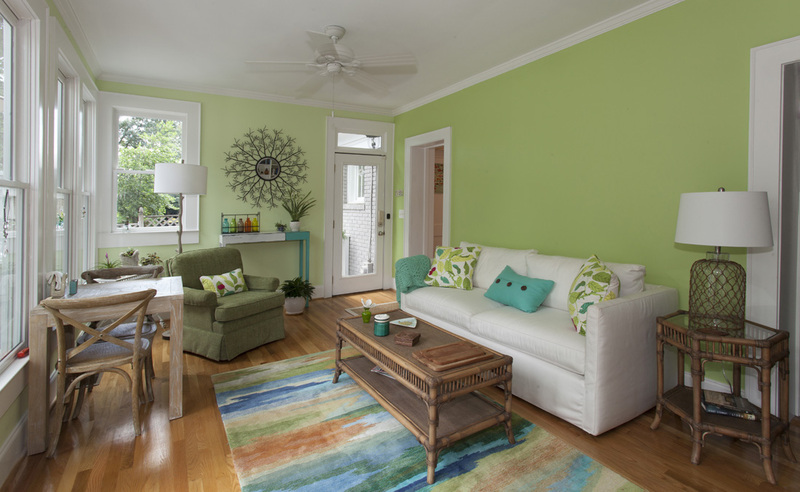 The sun room’s yellow-green walls were inspired by a pair of pillows that Winburn had made from some old IKEA fabric (pictured on sofa and armchair). 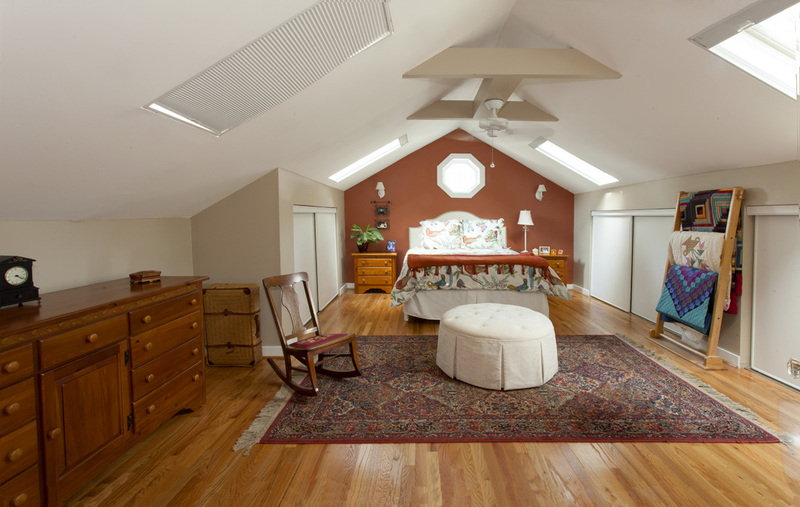 Double skylights allow plenty of natural sunlight— and moonlight—to flood in to a second story guest bedroom. 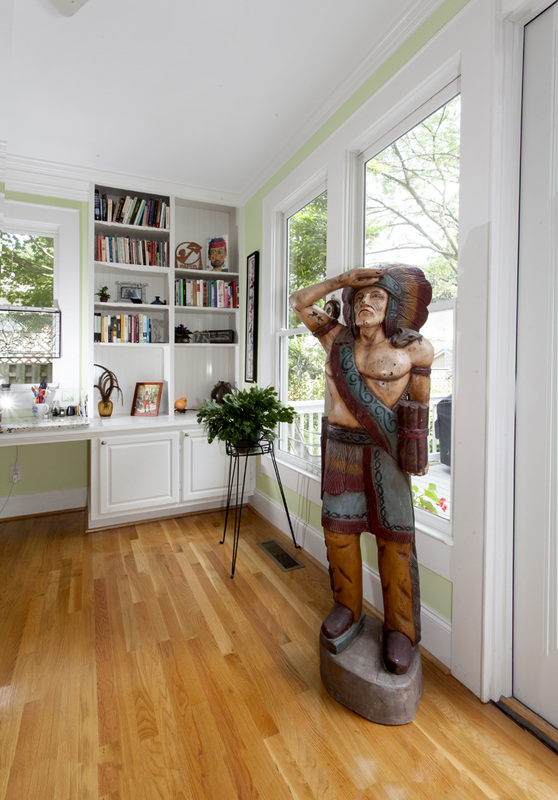 The carved-wood Indian sculpture that Winburn acquired from a relative. Settled in their home for 18 months, Winburn and Mason are fully reaping the benefits of their relocation, which now includes a 10-minute commute to CNN for Winburn (Mason works out of the couple’s house) and walkability to places such as Morningside village (“for Alon’s bakery,” says Winburn), Ansley Mall (“which has everything you’d ever need”) and Virginia-Highland. Perhaps the biggest bonus of all, though, is one they didn’t even plan for. In January, after a two-year stint in Knoxville, Winburn’s now 25-year-old daughter, Ella Dorsey, returned home to Atlanta and is now a meteorologist for CBS46. Dorsey lives in Midtown, another easy walk from the couple’s home. “It can’t even be a mile,” says Winburn, adding that Dorsey frequently eats dinner with the couple at their house on Sundays between her evening and late-night weather reports. For one evening each week, Winburn and Mason’s new intown nest is full again, and along with it, their hearts.